We are delighted to announce that one of our OxVox Reward Scheme partners, Manor Flooring, has generously donated two season tickets for next season. We have decided to present one of these tickets to the Oxford United Community Trust. 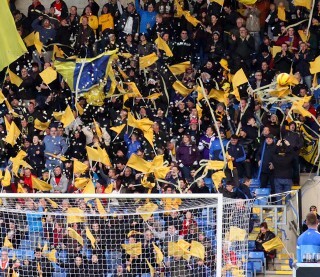 OxVox will add an under 18 season ticket, so that an adult and young person can attend OUFC matches and benefit from use of the Sensory Room, which we partly funded earlier in the season. The tickets will be presented to Chris Lowes for the Community Trust to distribute. The second season ticket will be given to an OxVox life member. It will be drawn at random by Dan Burgess from Manor Flooring on 24th April. The draw will be videoed and posted online. We will contact the winner, and he or she will be invited to have the prize presented on the pitch at the Doncaster Rovers match on Saturday 27thApril. All OxVox life members as at Monday 22nd April will automatically be in the draw for this great prize. The prize will be an Adult East Stand season ticket for 2019-20, which can be upgraded to any area of the ground by the winner should they wish, on payment of the upgrade price. If you are not a life member you can be entered in the draw by becoming one by Monday 22nd April. To upgrade to life membership online, please visit http://www.oxvox.org.uk/renew/ and pay the upgrade fee of £25 for adults (£15 for over 60s). If you are coming to tomorrow’s AGM in the Maurice Evans lounge, you can sign up as a life member at the door – if you wish to do so, please arrive in good time as we will be starting the meeting promptly at 12.30. Our life members’ Reward Scheme adds value to a life membership of the trust. It has now been running for some weeks and we plan to add further Partners over the coming months. For further information about current Partners and the benefits and discounts they offer to Scheme members please visit http://www.oxvox.org.uk/reward-scheme/ for details.